Channel the power of the full moon to focus your intent and guide your manifestations. Light on lore and heavy on practical ceremony, this book is an ideal reference guide for both novices and experienced practitioners. 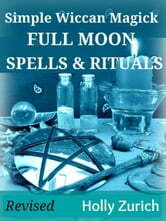 Each full moon spell contains traditional correspondences, a complete ritual and seasonal recipes. All have been thoroughly researched and designed for today’s busy Neo-Pagans. Moon worship has been part of our history since the earliest days. The constantly changing cycles of the moon enabled ancient civilizations to plan and chart time. They also discovered that special energies correspond to the different phases of the moon. Today, these connections are being rediscovered as we seek to fulfil our dreams and align ourselves with the universe. There are 13 full moons per year – one every 29.5 days. These spells, rituals and correspondences are designed to maximize the energy of the different full moons, but they can be used any time. If you feel you do not need the magick of a particular full moon, simply give thanks for that blessing during ritual and proceed to the spell of your choice. However, the power generated will be stronger during the corresponding full moon. 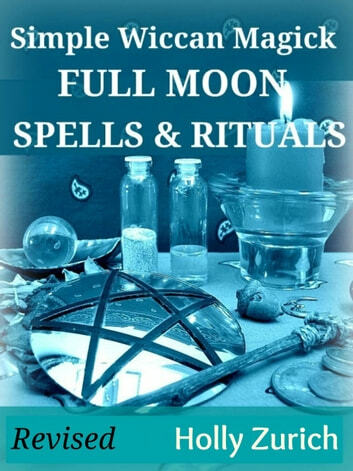 You can use Simple Wiccan Magick Full Moon Spells & Rituals as a stand-alone book, as a companion to my Wheel of the Year guide Simple Wiccan Magick Spells and Ritual Ceremony, or alongside any other Wicca books you may have. The first four words of the introduction state, "Since ancient times, Wiccans....". Ok. I had to paraphrase this to Pagans because Wicca is not an "ancient" school of thought. It has only existed over the last 100 years as a New Age religion with the ATC Church. Otherwise, it is a helpful reference book. I think the author needs to clarify that Wicca, with any tradition, is not an ancient religion.